Even as events were unfolding in Charlottesville on August 12 of last year, President Trump said: “we condemn in the strongest possible terms this egregious display of hatred, bigotry and violence on many sides.” On August 14, Trump called neo-Nazis and other white supremacists “repugnant to everything we hold dear.”. He again elaborated the next day: “And you had people, and I’m not talking about the neo-Nazis and the white nationalists, because they should be condemned totally. But you had many people in that group other than neo-Nazis and white nationalists. OK? And the press has treated them absolutely unfairly.” All three of those quotes were given before the NBC News piece quoted above. So where were the fact-checkers when Obama suggested that Trump has difficulty condemning Nazis? Obama attacks Trump for dividing Americans, when that is what the former president is doing himself. Trump hasn't accused Democrats of sympathizing with monstrous, genocidal ideologies. In his Nelson Mandela Lecture in July, Obama talked of “rabid nationalism and xenophobia and doctrines of tribal, racial, or religious superiority” and “right-wing billionaires.” Trump has never called his opponents “rabid." 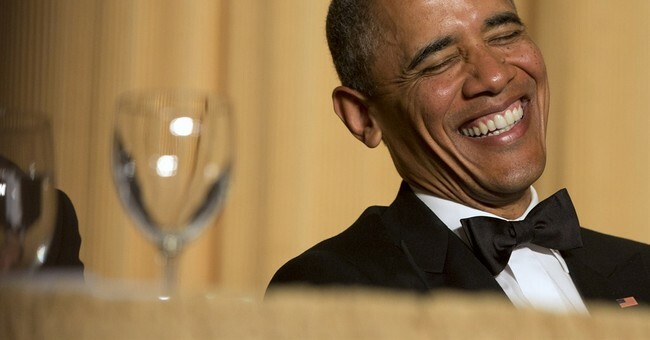 Then there have been Obama’s usual, divisive attacks on Republican policies, which he thinks are all about “cutting taxes on the wealthiest Americans.” But even the liberal Tax Policy Center pointed out, “The top 1% and 0.1% of taxpayers will see their share of income taxes rise in 2018.” The mainstream media won’t critically examine Obama’s oft-repeated policy claims, which frequently carry the implication that Republicans don’t care enough about the poor, minorities, or women. If Trump wanted to appeal to racists, why would he take such pride in continually reminding everyone that under his administration the US now has record-low unemployment rates for blacks, Hispanics and women? It’s surreal for Obama to attack Trump for wanting to “use the criminal justice system as a cudgel to punish our political opponents.” Obama’s IRS systematically went after political opponents, and his FBI and Department of Justice spied on Trump’s presidential campaign. Many apparently still believe that candidate Trump made fun of a disabled NY Times reporter. In fact, Trump made a type of gesture that he often used to make fun of people floundering away when faced with tough questioning. Trump used the same gesture to make fun of Sen. Ted Cruz and even himself. The media’s false statements have gotten completely out of control. Unfortunately, the narrative that Trump has trouble condemning white supremacists is just one of many that the media repeats on so many different topics. It isn’t surprising that even many very smart people, such as Mr. Wexner, sometimes get taken in.